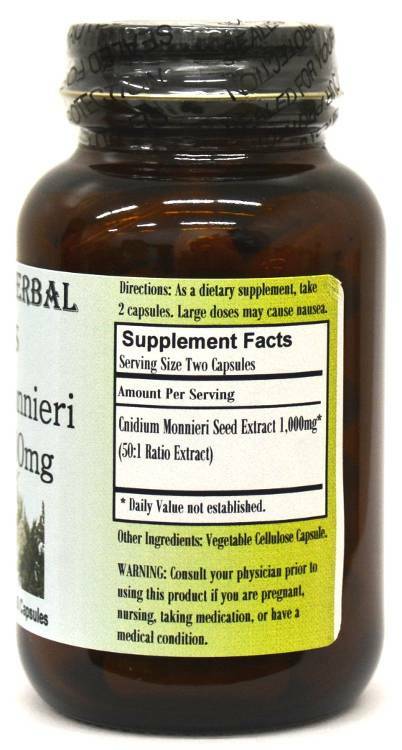 Barlowe's Herbal Elixirs proudly offers a powerful 50:1 Cnidium Monnieri Extract. Cnidium Monnieri has been a popular remedy in Asian medicine for millennia. Today it is mainly used to treat skin problems, to strengthen bones and as a libido booster for both men and women. It naturally increases nitric oxide release, increasing blood flow, and is also a good anti-inflammatory. Bottled in Glass! No Stearates! No Fillers! No Junk! 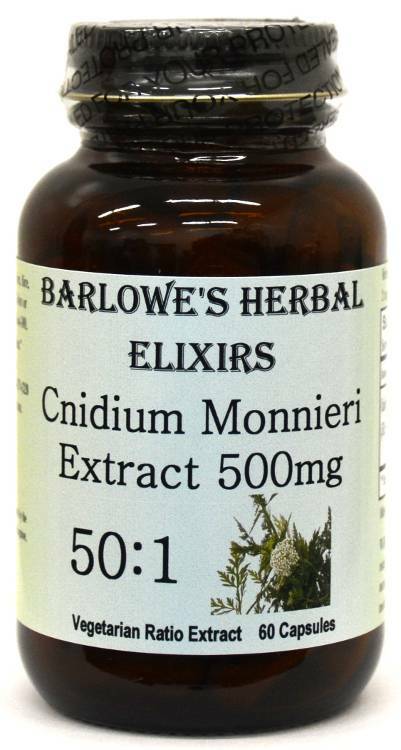 Barlowe's Herbal Elixirs proudly offers a powerful 50:1 Cnidium Monnieri Extract. 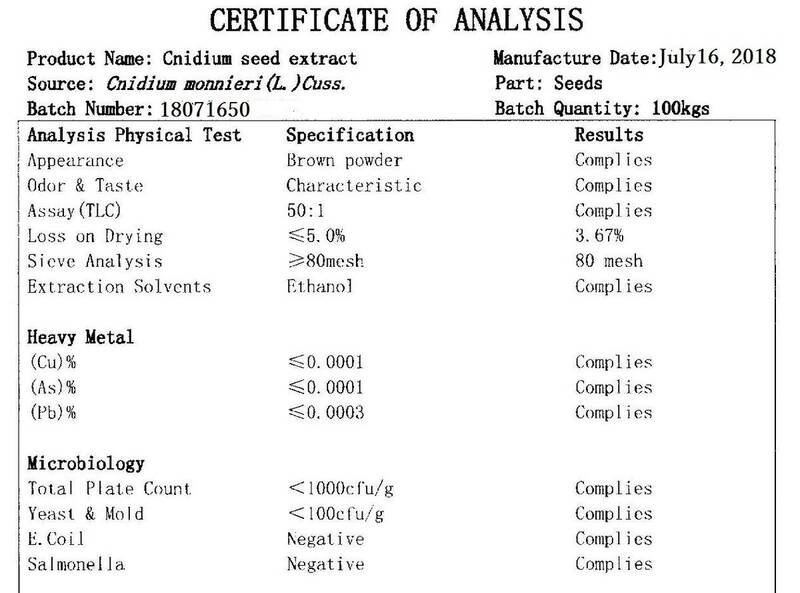 The Cnidium Certificate of Analysis (COA) of this particular batch is shown above. Note: This is a more potent, higher percentage osthole product than usual. Take no more than one or two capsules of this product initially until you gauge your sensitivity to it. High doses of osthole (the active component) may cause nausea in sensitive individuals. Cnidium Monnieri has been a popular remedy in Asian medicine for millennia, being first described 2,000 years ago. Today it is mainly used to treat skin problems, to strengthen bones and as a libido booster for both men and women. It naturally increases nitric oxide release, increasing blood flow, and it is also useful for increasing "pump" during exercise. It is a good anti-inflammatory. Bottled in Glass! No Stearates! No Fillers! No Junk! Dear Barlowe, I ordered some Maca from you last month and I really like it. But you sent a sample of your Cnidium Monnieri as well and that stuff is amazing. My wife and I are very happy with both products and your pricing is excellent. Keep up the good work! W.F., Omaha, Nebraska Barlowe, I tried 2 of the cnidium sample you sent but I thought it was having no effect after almost 2 hours, so being an adventurous type, I took 2 more. I was thinking that if this doesn't work, no harm no foul. I didn't pay for it anyway. Granted the dose was now twice what was recommended but another 1/2 hour passed and I was amazed! And no side effects! Have had great success with xantho also. L.P., Sunnyside, N.Y. Caution: This herbal extract is generally safe, but it is very potent and should be utilized with care. This product is for dietary use. If unexpected side-effects occur, discontinue use immediately! This product may cause nausea in some sensitive people. The above statements have not been evaluated by the Food and Drug Administration (FDA). This product is not intended to diagnose, treat, cure, or prevent any disease. Directions For Use: Take two or more capsules one to two hours prior to activity. May also be utilized prior to exercise to increase blood flow to muscles (muscle pump). For some people, dosage may need to be increased as results and usage amounts vary based on body type, weight and sensitivity. Large doses of cnidium may cause nausea in some sensitive individuals.